Shane O'Farrell was 23-years-old when he was hit by a car and killed. SHANE O’FARRELL would have turned 29 this year. Having finished a law degree and a masters in law, he was looking forward to getting out into the working world. He had applied for a job in Brussels and talked regularly of going to Canada or New Zealand. Six years on from his death in a hit-and-run near Carrickmacross in Co Monaghan, his mother Lucia wonders where her son would be now and if she will ever see justice served for him. 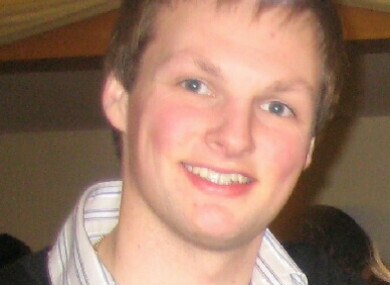 “Shane should be alive,” she told TheJournal.ie ahead of Shane’s sixth anniversary today. On the evening of 2 August 2011, her son was cycling home when he was struck by a car driven by Zigimantas Gradzuiska. The Lithuanian national had previous convictions for offences including aggravated burglary, road traffic offences and handling stolen property. Two weeks before the collision, he was arrested in Newry for three counts of theft. The day he struck the 23-year-old with his car, Gradzuiska was on bail from courts in both Monaghan and Cavan and on a peace bond from Louth Circuit Court. Speaking about the case in the Dáil last year, Sinn Féin’s Gerry Adams said the day Shane died, the car that struck him had been stopped by the garda drugs unit and “had no NCT and was not roadworthy”. “The accused, who was in the passenger side when the car was stopped, assumed the driver’s role in the presence of an garda despite not being insured,” Adams said. In the inquest into Shane’s death, the court heard that gardaí at the scene felt occupants of the car were in possession of a controlled substance but the car wasn’t searched. Within an hour, Shane was dead. Gridziuska did not remain at the scene of the collision, but was arrested later that day. He was handed an eight-month sentence for dangerous driving causing death in February 2013, but it was suspended on the basis that he would leave the country within 21 days. Shane's had just finished a masters in law and was applying for his first professional jobs. “Each year that passes, Shane is further and further away from me,” Lucia O’Farrell said. Our beautiful child, he would have no understanding of all of this. He was a person of love, he never judged anyone. For six years, her family has been asking how Gradzuiska, a repeat offender who was on bail from multiple courts, was at liberty on the day Shane was killed. They also want to know why he did not serve jail time for the incident, and was instead given the option of leaving the country. In January 2012, the O’Farrell family made a complaint to the Garda Síochána Ombudsman Commission (Gsoc) about the case. Five years later, the investigation is still ongoing. Gsoc has, however, informed the O’Farrells it hopes to conclude its inquiry this September. O’Farrell said she hopes the report will “clearly outline that there was massive failure over the two-year period prior to Shane’s death”. She said she feels her family, which conducted its own research into Gradzuiska’s criminal history as part of its six-year campaign, has been “treated appallingly” by the State. “It’s an abuse, our family has been treated with abuse. We can’t grieve. Grieving has been put on hold. A healthy 23-year-old went out and came home in a coffin. He was killed in his own country by a foreign national who was out on bail,” she said. Email “'The State failed to protect Shane': Family of hit-and-run victim still seeking answers six years on ”. Feedback on “'The State failed to protect Shane': Family of hit-and-run victim still seeking answers six years on ”.